2NE1 Hip Hop The Allkpop World! 2NE1, the four member hip hop allkpop group who storm the world and recently voted the "Best New Band In The World" by MTV USA are also known by the names "To Anyone" or Twenty One" was founded and managed by YG Entertainment in 2009. The four members in the group are CL (aka Lee Chae-Rin), Dara (aka Sandara Park), Bom (aka Park Bom) and Minzy (aka Gong Minji).They are commonly referred to as "the female Big Bang". Before making their debut, there was a lot of hype created when Yang Hyun Suk, CEO of YG Entertainment, introduced these four members group in May 2009. The group first appeared on the promotional video for the "LG Cyon" with fellow label mates "Big Bang" where they gained lots of exposure as a group with their Singles reaching Number 1 on numerous online music charts. They have released one mini album (2NE1), 2nd Mini Album: All Kill and one full length album (To Anyone) and have produced many popular and Number 1 songs from both albums. Their debut song titled " Fire " was a hip hop song (produced by 1TYM leader 'Teddy Park') which stayed in line with the group's image. There were two version of the music video released which garnered approximately 1 million views in just one day, with their debut song and pre-debut promotions, they quickly became very popular online and ranking Number 1 on the M.Net's online charts. In 2010, they released their first full length album " To Anyone " where they promoted three title songs simultaneously - "Clap Your Hands, Go Away and Can't Nobody" with " Go Away " becoming another of their Number 1 songs. They then followed up with promotions for their song "It Hurts" which is the only ballad song they have promoted. This very popular 4 girls band also released their " To Anyone " album in Thailand and also introduced the single "Don't Stop The Music" which was a special gift for their Thai fans. They also joined the rest of the YG Family to participate in the 2010 YG Family Concert which took place over two massive nights at "Seoul Olympic Park Stadium". In 2011, member Park Bom revealed her solo song "Don't Cry", following this release leader CL shared that they would be revealing their second digital single "Lonely" in May 2011 which would have a combined pop and R&B feel. 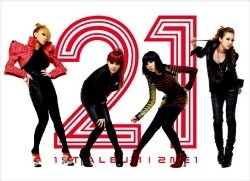 2NE1 Reality TV Show appropriately titled "2NE1 TV" which follows the lives of the members has been a hit and taking the audience on a journey since their debut. They have successfully filmed two seasons of the show and are now currently filming for the upcoming third season. Allkpop 2NE1 looks set to enjoy their wave of popularity.